Description: Ilphrin was a mortal Drow, living his life as a manservant to one of the many houses that thrive in the Underdark. One day in an expedition, Ilphrin fell into a pit. Said Pit connected directly to the center of Toril, in there he found his body consumed by the magma. Yet he did not die. For one hundred and eight days he climbed the pit to the surface – Something made easier by the two extra pair of arms the magma gave to the drow. Once he reached the surface, he opened a temple dedicated to the sacred flame, and after one hundred and eight years, his body turned to ash. Yet his followers swear Ilphrin still guides them on their dreams. Rituals: To become a Cleric of Ilphrin, one needs to do a Baptism by fire. The aspirant by his own will dives into a lava pool (found in all Ilphrin temples) if he survives, his body will have the mark of Ilphrin, his forearms crack and lava can be seen underneath of them. Culture: Followers of Ilphrin believe in self-sufficiency and acceptance of how random and chaotic life truly is. One day you are a slave, the next day a God. The goal is self-improvement and living each day as their last. Symbol: A Salamander being hugged by 3 pairs of arms. Description: In the Emerald Forest, Wood Elves, Humans and Orcs share a deity. “Spring”. Every year, the three people put their difference aside and make an offer to the Avatar of Spring, wishing renewal from the past year. A big parade that goes through the entirety of the Emerald Forest happens to celebrate the coming of Spring. Culture: Spring is a deity that is only in the mind of the common folk once a year, yet their clerics and followers work on costumes and parade cars all year around. Symbol: A creature with a bird head, wolf limbs, and wings. Description: The Match Making goddess, Red Mane is followed by both those who wish to find a wife or a husband, but by those who match people with their mates. Her temples often double as coffee shops with many cozy places to sit down, drink and eat something sweets. The perfect place to find love – Or just to have a good time really. Culture: The “Red String of Fate” that connects two would be lovers concept is often associated with Red Mane. A string of her hair could connect the hearts of two people forever. Therefore, it’s common practice for Clerics that follow Red Mane to wear red flowing hair wigs. At every meeting, they offer to each candidate a flock of their wig. Those who accept the flock, are matched accordingly to how much hair they take from the wig. Symbol: A female figure with long flowing hair, that extends to the infinite. Description: The prankster god, the Maiden clad in Yellow is worship by children and those in contact with their own silliness. While there aren’t any temples created in dedication to the Maiden, her followers meet in covens around taverns to plan elaborate ruses for their own amusement. Laughter is their goal, their own laughter that is. It is said that every laugh makes the mystic yellow used as clothing by the Maiden shine brighter. Culture: Her followers are obsessed with the color yellow, so they always dress up around this color. Around cities where her worship is common knowledge, people that dress with yellow pieces of clothing are often treated as fools. Symbol: A stylized female figure, always painted with yellow colors. Description: The Lizardfolk normally have little use for a deity. They live in the moment, act on their instincts and follow their leader – Often a patriarch. They usually worship gods of reproduction and survival. However, the legend of the Big Lizard is something ingrained in their Lizard Brains. The idea of a big, strong Lizardfolk with an axe made of bones is something that sprang from their collective mind. When they are in distress or wish to offer retribution, it comes out from their lips: “Big Lizard help me”. Culture: In times of war or when facing a formidable foe, the Lizardfolk call out for the Big Lizard. Those who call for the Big Lizard and defeat their enemy belive they are blessed by the entity, so they strive to be more like the Big Lizard themselves. 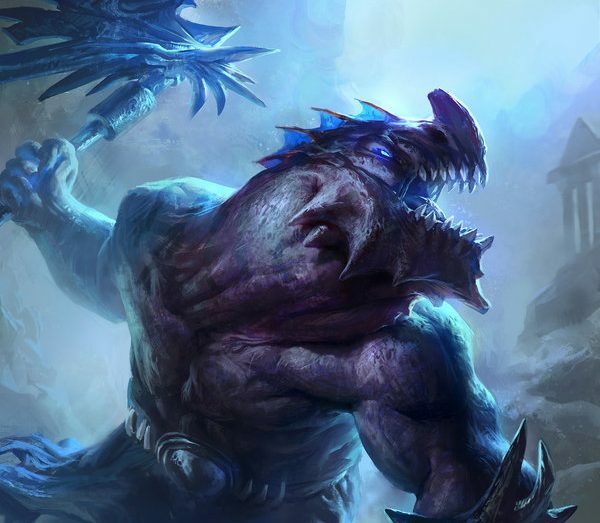 Symbol: A very big lizardman holding a bone ax. Description: For a universe to exist, it needs a Witness. Before all the gods, before anything even existed, it was there. Watching it. And that is all the Witness does, his eye is all encompassing and his desire is to see it all. His followers collect knowledge and share in libraries. No secret is out of place, no subject is taboo. The only rule is that when it comes to knowledge, their followers are not allowed to speak their mind. Culture: To follow the Witness is to hold no public judgment. No matter how terrible or exciting a piece of knowledge is, their followers are not allowed to react to it externally, only in self reflection. This is why most of their followers wear masks that hide their features when they are in their library-temples, so they don’t acidentaly influence other people with their reactions. Symbol: A featureless porcelain mask with holes for the eyes of the wearer. Description: A god created by the Warforged, to be the symbol of creation. The paradox is what gave it spark of divinity. Part nature, part tool, the Made Maker lies motionless on it’s main tmeple. Listening. And not doing anything, unless someone makes him do. A puppet created by those who desire to be more than puppets. Culture: There are two type of followers to the Made Maker. Those who are attracted of the paradox of a creator that cannot act out of it’s own will, and those created by said creator. Those made by the maker have it’s symbol grafted on their backs. Symbol: Three faces with a tree growing out of the middle.